Group of melted silver objects and an old button or weight (listed separately). 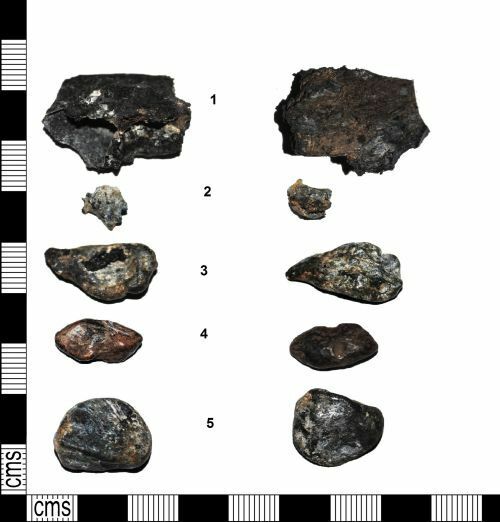 The silver objects (2-5) were found encased in melted plastic box (1) & associated with other burnt objects as well as the button. It is worth noting that local tradition has it that there was a fire at a nearby hall. It is likely that this material was dumped while clearing up after the fire. None of the silver objects can be identified with any surety. However there appears to be a late Roman coin fused to one of the lumps of silver (5). It is not unreasonable to assume it was a coin attached to a silver ring, or possibly chain. The separate lumps of silver are from different objects originally as they of different grades of silver. Due to the damage from melting it is impossible to say what any of the objects are or when they date from.